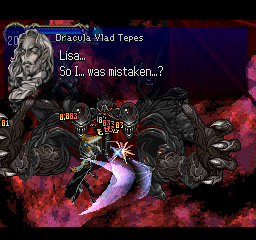 Castlevania: Symphony of the Night is an action role playing game for the PlayStation. 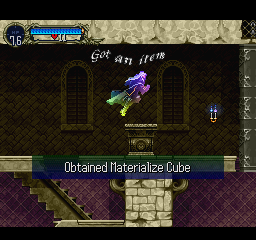 This game in the Castlevania series departs from the designs of the others, and takes the series into an RPG approach. 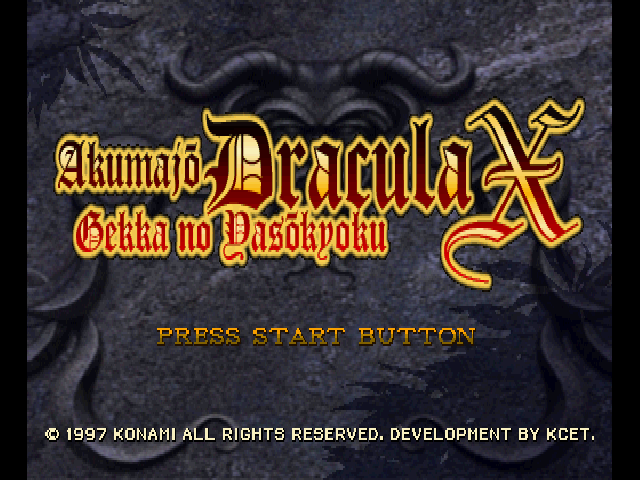 Known in Japan as Akumajou Dracula X: Gekka no Yasoukyoku (Demon Castle Dracula X: Nocturne in the Moonlight), this game takes place after the first Dracula X game (specifically, “Dracula X: Rondo of Blood”). You play as Alucard, a returning hero from the third installment of the series on the NES. Alucard is Dracula’s son, who had gone into a deep sleep for many years until he was awakened by the return of Dracula’s castle. As Alucard, you have a large number of equipment to choose from (daggers, one-handed swords, two-handed swords, fist-type weapons, rods, as well as armor, shields, capes, helmets, accessories, and usable items). Alucard has many techniques at his disposal. First, he has a large set of spells (about 10 or so) that he can perform by using his MP (one of the three main statistics, in addition to HP and Hearts). He can transform into a Wolf, Bat, and Mist (each of which has a few abilities of their own). He also gets familiars of varying types (demons, faeries, and even a sentient sword) to help fight his enemies. The game itself is huge. 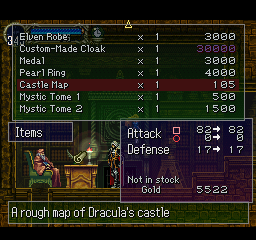 The amount of ground you have covered in the castle can be viewed on a Metroid-style map that takes up just about the entire screen when it’s full. There is also a separate area after the castle which is just as big. There are plenty of secret areas for you to find as well. This patch features a complete translation, multiple code hacks (8×8 and 8×12 vwf and other fixes for expanding available space on screen and in memory) and several graphical changes, including compressed graphics.